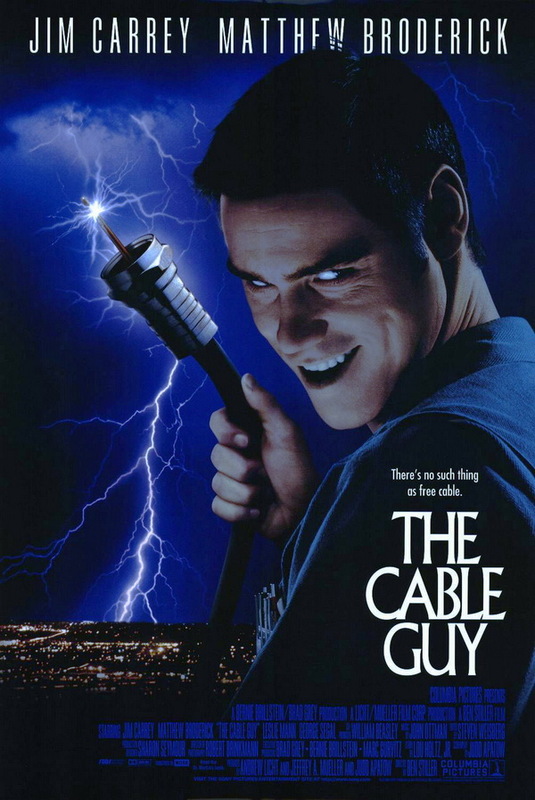 The Cable Guy. Columbia Pictures 1996. The poster shown here is overwhelmingly the image associated with this movie, but for the longest time I took it at face value, as if it was telling me Carrey’s character is really a sinister, murderous psycho. However, in light of the descriptions usually attached, I think this is a joke that’s lost its context. From the descriptions, I think I see a story about a needy character who has more of an exasperating effect than a worrying one. Less Fatal Attraction, more What About Bob? But then looking at IMDB just now I’m thinking I’ve underestimated the darkness again. I expect good things from Matthew Broderick in a beleaguered straight man role, and Jim Carrey’s proved himself in pretty much any kind of role. Steven moves into a new apartment, having had his girlfriend Robin respond to his marriage proposal by throwing him out. The guy who comes to hook up his cable is uncomfortably friendly, and invites him to hang out the next day, evading a brushoff and getting Steven to reluctantly agree. Steven tells “Chip” about his trouble with Robin, and Chip gives him some good (though gamesman-ish) advice involving inviting her to watch her favorite movie at his place, but the evening she comes over Chip sabotages Steven’s cable connection in retribution for not returning his ten calls that day, extorting another outing in return for a reconnection. Chip’s erratic behavior includes giving Steven top of the line multimedia equipment as a gift and throwing a karaoke party at Steven’s place with that equipment. With the Robin situation improving, and Chip’s presence overbearing, Steven tells Chip they simply can’t be friends, but quickly finds having Chip as an enemy is even worse. While they don’t seem like interchangeable performers in the abstract, I’ve noted previously that some Adam Sandler roles feel more like Jim Carrey roles (for example, Click feels like a story in the vein of Liar Liar or Bruce Almighty), but this time Chip reminded me a lot of Sandler. Perhaps it was the unusual voice developed for the character, which includes a lisp I’m not very comfortable with, but it’s not just a joke but also allows Steven to do something nice for Chip at one point (giving him a speech therapy tape). Chip is a deeper character than a typical Adam Sandler manchild, but on the surface, the mercurial, innocently annoying character is quite similar. Apparently, What About Bob was cited as an inspiration for the original draft of this story, but Stiller and Apatow as director and producer wanted to darkly explore the power held by someone skilled with A/V technology, which creates a dissonance in tone I think serves the intended creepiness, but leaves a film that isn’t really one thing or the other. Chip’s not as harmless as Bob, nor is he as dangerous as Alex Forrest. He’s a comical psychopath, which is not a pair of words that should go together. This story is trying to make a point about overconsumption of television, but I’m not quite sure it’s present enough in the plot. Chip is the way he is because his parents left him to be raised by the TV, leaving him clingy, awkward at human interaction, missing key social concepts, and a little bit of a fourth-wall leaner (he sings along with the background music on at least two occasions), and resolving the problem of Chip ends up striking a blow against dependence on TV, but besides Chip’s origins and exit, it doesn’t come up much more than you’d expect for a story about a guy whose primary skill is installing cable. This is altogether a schizophrenic movie, attempting to blend two disparate genres and tying it together with a lukewarmly presented moral. The fun parts are fun and the disturbing parts are disturbing, but when do you ever want to have both at once?